Beijing has responded to Donald Trump’s recent labelling of China as a strategic “competitor”, by telling the US President to end America’s “cold war mentality”. 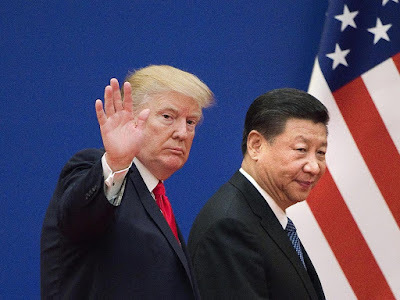 The remarks follows the publication of the Trump administration’s National Security strategy on Monday, in which the President accused China of pursuing a “repressive vision” and designing economic policies to weaken America. On Tuesday, the Chinese embassy in Washington hit back, describing the Trump administration’s “America First” theme as “selfish”, and warned that promoting rivalry between the US and other countries “will lead to failure”. “The Americans on one hand say they want to develop a partnership with China, but on the other hand they take an oppositional stance. This is contradictory,” it said in a statement. Speaking to reporters in Beijing she said: “Any country, or any report, which distorts the facts, or maliciously slanders will do so in vain. “No one should be under the illusion that China will swallow a bitter pill that affects its interests.